This is a wine or at least a winery that people should be able to find. 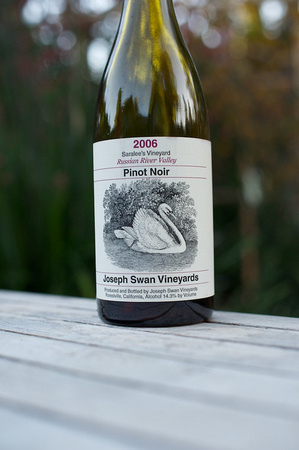 Joseph Swan is one of ye olde California wineries and if you ever see a Pinot saying they use the Swan clone, yup Swan was one of the first Pinot producers in the state. If you haven’t been, I would definitely recommend a visit to this unpretentious winery just off River Road outside Santa Rosa. This is a 2006 Saralee Vineyard Pinot Noir. The color is an amazing light brick red with a hint of brown on the edge showing a touch of age. The nose is just wonderful. To be sure there is cherry and strawberry but there is a lot more including hints of cinnamon and black licorice. Quite complex and a joy to smell. On the palate there are berries with currants now and the licorice persists into the finish. To me a very nice wine for $25. I definitely recommend it. I am a little loath to post this wine (especially since I have a bunch of others to post!) because this is a wine that pretty much nobody will be able to find. 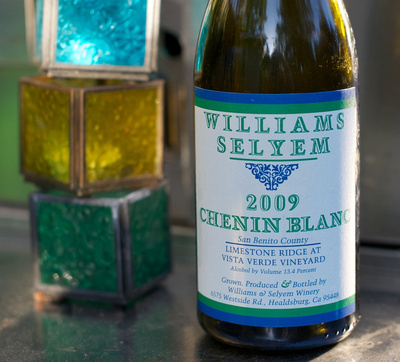 Selyem is one of those mailing list only wineries but it was the one my hand found as I was looking for a match for dinner. As soon as those free samples start rolling in I’m sure I will have more main stream wines for you all ;). This has a delightful nose of what started as lime zest and what struck me as cotton candy though I also smelled green apple and chalk as I swirled the glass more. On the palate there is a splash of lemon juice bringing nice acidity to the minerals all coming together for a decently long finish. I know they ferment in cement so the minerals are not a surprise. A light a decent match for my pasta. I would recommend if it was more widely available :(. So I was talking to my parents this evening. Apparently they had somebody to the house and they asked something to the effect of “Does he really taste (smell?) those things?” Despite my natural cynicism I will treat this as a real question ;). When I smell and taste wine I smell and taste things that remind me of other smells and tastes. I find that trying to put a name to those things is an interesting intellectual endeavor and one that actually increases the enjoyment of that wine. Complex wines will make you think of many different things simple wines, not so much. Thinking of what the wines tastes like makes you examine the taste more critically. Taking notes is extremely nerdy but will actually make you a more active taster over time. I told my parents to get a wine and then look for a review on the web. There will be tasting notes. Open your wine and let it breathe for at least 1/2 hour and then see if you smell and taste the same thing. You may agree on some of the notes and disagree on others. Your journey has begun! Which brings us to tonights wine. 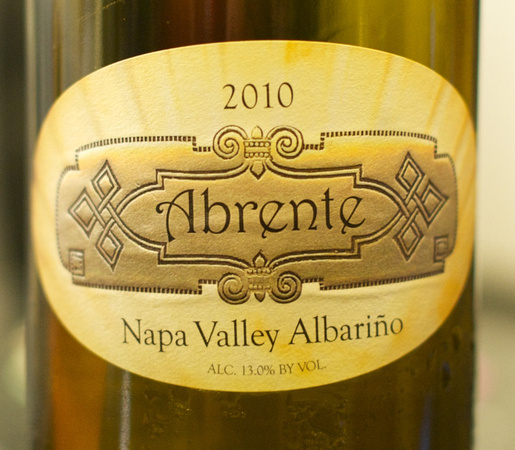 Abrente 2010 Napa Valley Albarino $25. This is a combo effort of Morgan Twain-Petersen (Bedrock Vineyard!) and Michael Havens (yeah THAT Havens). I am a big fan of Bedrock Syrah but more about that another time. California Albarino, interesting! I’m on the bedrock mailing list so I got an email about this and since I like the winemaker and I like the grape I had to try. After giving it some time I started to smell what I can only call bubble gum (I kid you not) and cantaloupe with a hint of lemon zest on the nose. In other words, very interesting. On the palate there was a touch of effervescence but a lot of lemon, yellow peach, what feels like peach skin on my tongue and a mineral dry finish. A very interesting wine for me. At the price point it seems a bit expensive but I will say it is worth trying if you like Albarino.